Living in Vietnam convinced me that noodle soups should not be confined to a particular time of day. For breakfast, lunch, dinner, snack time, or any time at all, a good bowl of soup is never something to turn down when a person is hungry. 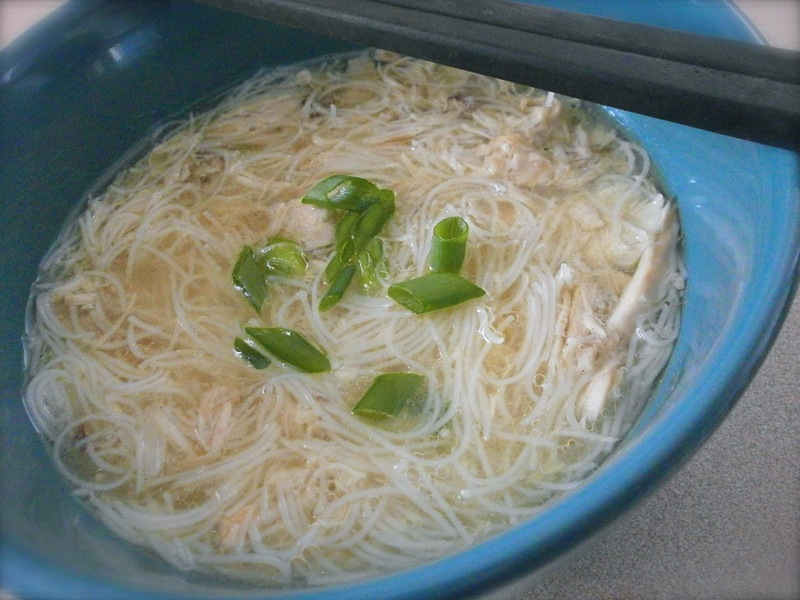 Lately, this simplified version of Vietnamese chicken hu tieu has been my go-to option. This soup is easy, delicious, and requires just a few simple ingredients. Six to be exact. Bring broth and ginger to a boil. Reduce heat and simmer for 10 minutes. Add desired amounts of chicken and rice noodles. Cook for 2 minutes or until noodles have softened. Add fish sauce and top with chopped green onions. Notes: It is best not to let the noodles sit in the warm broth too long. If in doubt, or if you plan on storing leftovers, soften the noodles in boiling water, toss with a small amount of oil to prevent sticking, and keep noodles separate from the broth until closer to serving time. Find more recipes at Pennywise Platter and Saturday Dishes. I have never had this soup. I would like to try it some time. I pinned it! Thank you so much for stopping by and linking up with Saturday Dishes. Wow, I love how simple this looks! And thanks for the noodle tip! Thanks for linking up at Saturday Dishes!